Riding along the rivers and canals bicycle tracks, and arriving at our accommodation in a the middle of a medieval town. Coffee and cake breaks after even a few kms of cycling. Planning the next days route and activities with Robin and Geoff. Getting lost, blaming the maps and GPS. The German countryside in spring. So many flowers and fields of green. eBikes - cheating, especially when they overtake you. Getting lost. Fun for a while, frustrating at time and inevitable. Maps, GPS help to find the bike track, but missing one little sign can cost one hour. I preferred the quite country roads, if the bike tracks were hard to find. The acquisition of the bike box and packing almost rivaled an Indiana Jones script. So I wandered around, looking for FGS, with no success. After lining up with my bicycle at a parcel/postage store, still no success or even hint of success. I had plenty of time, so was not worried at this point, and back tracked to my soon to be new friend at the luggage storage. He was amazed how stupid I was, and gave me more directions, writing on the ever expanding post-it notes, that it was the "Welcome Centre" that would be the next clue to success. I had booked my first night's accommodation in Frankfurt at the "Welcome Centre" (information), so found it easily and lined up again. From there, I was given the next clue that I had to go through to the baggage claim. So off I walked, thinking success was near. There was no obvious way to go back into baggage claims area, as it is a one direction route for arriving passengers. So I headed along until I ran out of arriving terminal. As the saying goes "when in Rome do as the Romans do", so joined the cycling terminal staff and pedalled back through the terminal pedestrian traffic to the "Welcome Centre". Once again, I was developing another new friend, and with more explicit instructions, I had to find a button to push and be buzzed through. Five minutes later I was in the baggage claim area and only 30m from where the luggage storage guy had explained 40 minutes before. It was so simple! The lost luggage guy pointed me to Belt 11 at the other end of this area. 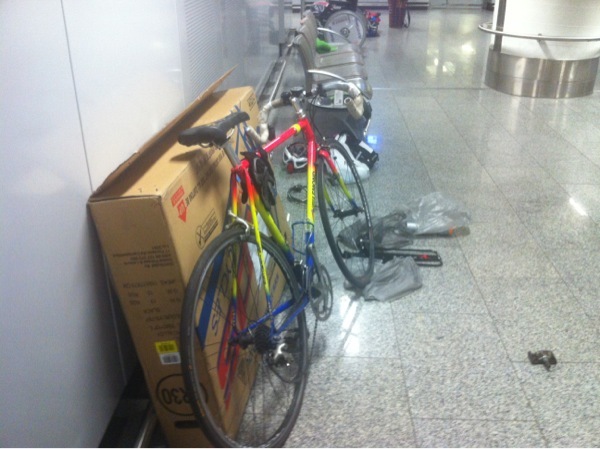 My last cycling experience in Germany was inside a baggage collection terminal! 1. Removed pedals, remembering the left pedal is left hand thread. 2. Put dérailleur to smallest cog and remove both wheels. 3. Remove rear derailleur and put it in a bag. Leaving it on it the highest likelihood of damage. 4. Loosen handlebars at stem and rotate. I had to remove the Garmin GPS holder as it stuck out a bit. 5. Remove seat post with seat attached. Practice at home as a seized seat post can take hours to extract. (See preparation blog). Hint - use an aluminium seat post if possible, as carbon is prone to crushing when using a seat post rack. 6. By now there should be bike bits everywhere. Grab the lose bits and bag them in preparation for attaching then to frame or wheels in the box. There is less chance of losing bits if the box box burst open, as happened on the way over. 7. Building the box- this box was a standard issue airline box, which means it is longer and slightly narrower then the one from the local bike shop. I think they are longer so that the rear wheel can be left on. Knowing that Air China does not specifically mention allowing bicycle boxes, and has an overall limit for luggage of 154cm, I thought the box looked way too long so shortened it by about 600mm - hence the excessive tape usage. Also I tapped the stapled joint as it had burst on the way over. 8. It's almost time to package the bicycle. This time I turned the frame over and the wheels fitted ok. It's best to pull the handlebars right off to make the package as narrow as possible, but rotating left it with 1 cm bulge. 9. Deflate the tires and wipe off all the dirt from tyres and frame, as customs in Australia hate dirt being brought in and will charge to clean it to their standards. I found a street cleaner in Frankfurt who kindly high pressure hosed my bicycle, but it still needed a full wipe over. 10. Once packed, I borrowed a big, fat marker pen and put 4 large upright arrows and wrote my name, address and phone on the box. 11. After cutting out two carry holes and reinforcing them with tape, I was ready to check in. The box was manageable to carry, but getting a trolley made that easier. The check-in guy at first suggested that excess luggage charges would apply. After he checked, no excess was applied and my luggage was taken away to be checked through to Sydney. The bicycle was intact when I got home. On the way over the previous box burst at the staples, so lots of tape this time. With the church being directly across the road, I expected an early start, but not 5:30am, when the bells started. As I was not sure if breakfast was included, (I was tired & looked like a hobo when I checked in), I did a google translate to read up on the hotel. It had been with the same family since 1907, and had the neat, tidy and efficiently run feel of a family run hotel. 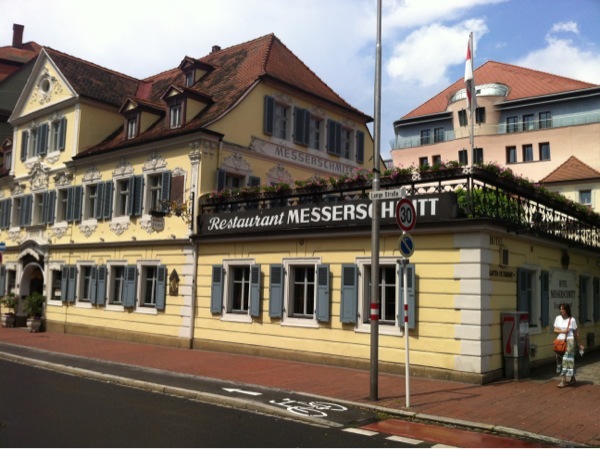 With another full breakfast as fuel (including my German version of a bacon & egg roll), I headed off towards Wurzburg at 8:35. On one stretch of country road, I tagged behind a cycling couple. After about 5km, I thought I'd better ask permission to draft, and they happily agreed to me sitting behind. They looked serious with high tech gear, so the 20yr old Lemond bicycle was no threat. Eventually after finding every hill in Wurzburg, I arrived almost to the hour when I had met R&G on Sunday a week ago. I bought the cheapest train ticket on the slowest train (28euro + 5e for bike). The trip down was only 19e (I didn't know a bicycle ticket was another rule, but the ticket clicker didn't enforce it). As I boarded the slow train with lots of other cyclist (mainly older couples with touring gear), the rain started so I had excellent timing. There are only one or two cycling carriages and the cyclists are usually a friendly bunch as they stand or sit to keep an eye on the stacked bikes. I sat opposite the owner of a classic 80s Peugeot racer. She was a medical student who had perfect English and had been on a 150km training ride in preparation for a 300km ride in Sweden next weekend (Vatternrunden). So she could talk bicycles and cycling for 2.5 hrs and the trip went quickly. I checked my emails on arrival at Frankfurt HBF (13:30) standing near the Starbucks. Received and sent one to home. Also Geoff had sent an SMS claiming clemency for being two (2) days behind in their blog. As it was fine and I had plenty of time till my 20:30 flight to Sydney via Beijing, I went for a ride along the Main River and could see evidence of the paths being flooded earlier in the week. I also saw 3 enormous river boats carrying industrial materials. Most of these boats had been stuck between the locks, waiting for the river to drop so they can clear the bridges. The train to the Frankfurt Flugh (airport) was easy, I packed the bike , checked in and am waiting for boarding. The buying of the bicycle box, packing and checking in gets its own blog entry as it was a bit of an adventure. 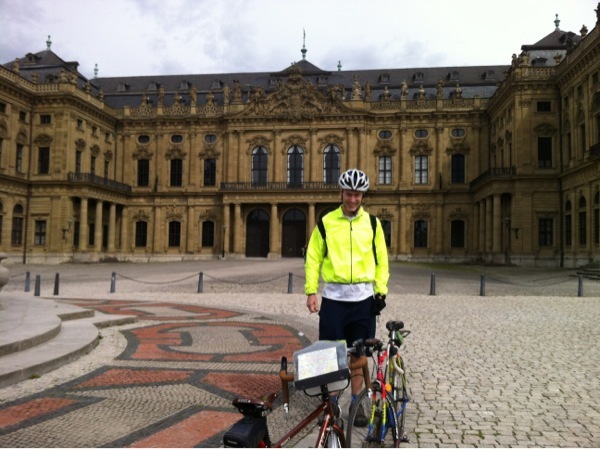 Heading back to Wurzburg - the start of my cycling adventure a week before. Note the little cycle track sign. Note the VW style poppy flower on the handlebars. The bicycle signs are good most of the time. We awoke to another sunny day, although thunderstorms were predicted. The completion of keeping the blog up to date has become very competetive. 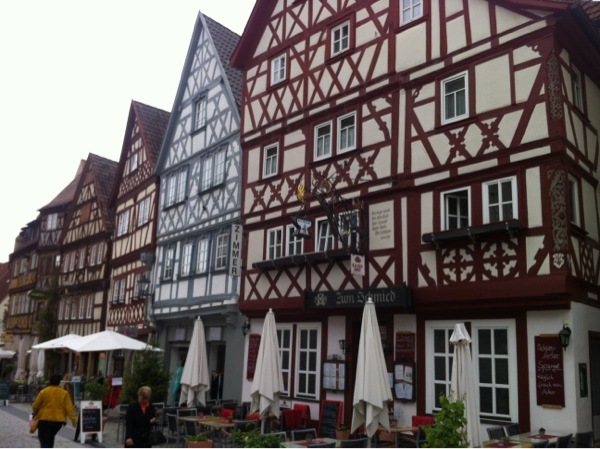 Geoff has dedicated the next 2 days in Bamberg to catching up his blog and his plan is that if I cannot get Internet in Beijing airport, he will streak ahead. They also plan to sleep in with me gone! After a good breakfast, we rode back into the pretty little town of Hirschaid, and back onto the track running along the Main-Danube kanal. It was the same unpaved as before and good for easy 23km/hr. On the way we watched a skulling regatta just starting with a number of two and four boats in the water. The straight canal is perfect for this racing, and they must shut down river traffic for it. It was a little further then 10km into Bamberg, and we easily found the town square and after a quick reconnaissance of the area in the crowds, we stopped for coffee break. We then headed up to find the Dom Cathedral, New residence (for prince bishop in 1697) and Rose Garden. Then it was back down the steep hill to see the Old Town Hall, and take lots of photos with the crowd of other tourists. The rain come down and with stayed dry under a bus shelter. It was time to farewell Robyn and Geoff at their hotel (on a very steep road). It was sad to say goodbye after a wonderful week. The have 2 weeks to get to Prague before flying out. I was now at the mercy of the GPS, and in general it behaved to get me along the canal cycle path for a 18:30 finish after 77km from Bamberg. The thunderstorms continually threatened, but I was lucky (as Geoff had done a rain dance) to dell about 20 drops. I did go thru some water on the bike track. I usually waited and watched a German cyclist before entering, and I carefully stayed almost dry. The river had dropped, but is still high. Finding a hotel took some navigation, and I found an excellent old world one opposite the church. It rings the bell every half hour.! Dinner was in the hotel, followed by a short walk around town. Tomorrow I ride and find a train to Frankfurt and then to the airport. We cycled out to the ex-nazi rally park, which this weekend was hosting a large rock concert. Lots of young people drinking beer at 9:30am, and camping very close together. The document centre took a number of hours to listen to the audio tour on the history of the nazis. The museum was in an amazing unfinished theatre that hitler had commissioned. 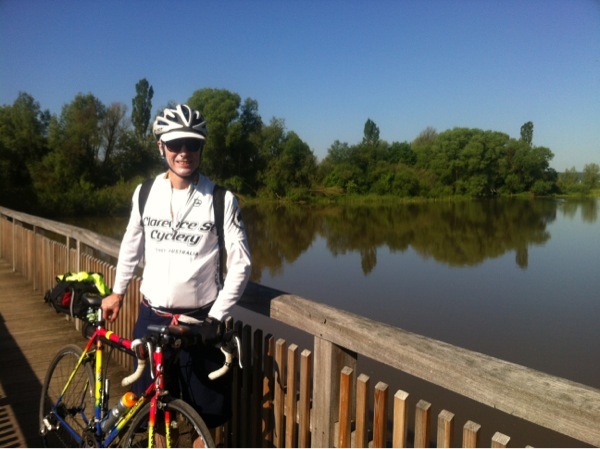 We cycled over to the Maine kanal and then spent the next 4 hrs cycling along beside it. Tomorrow we cycle 10km in. 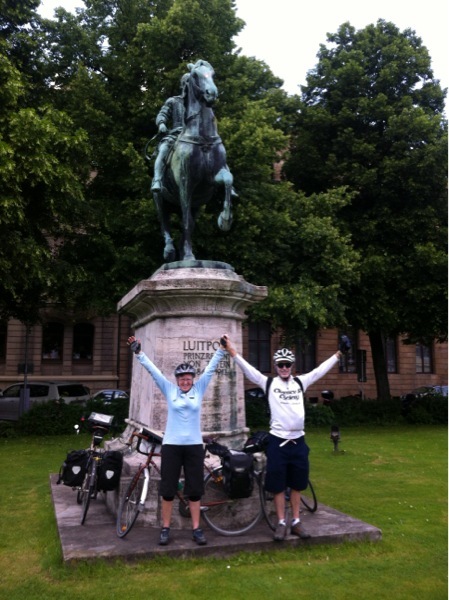 We cycled into Nurnberg, Nuremberg today. It was a long day and we covered 66km, ending up getting lost in a muddy trail in the forest. Even with 2x GPSs and 3 detailed maps, it easy to mistake a turn off. The cycle tracks vary from mini roads to single lane dirt/gravel tracks. It's an interesting city and has been totally rebuilt since ww2 when it was flattened. Tomorrow we look at the Nuremberg rally museum and Hindenburg airfield ,where the zeppelin to New York left. 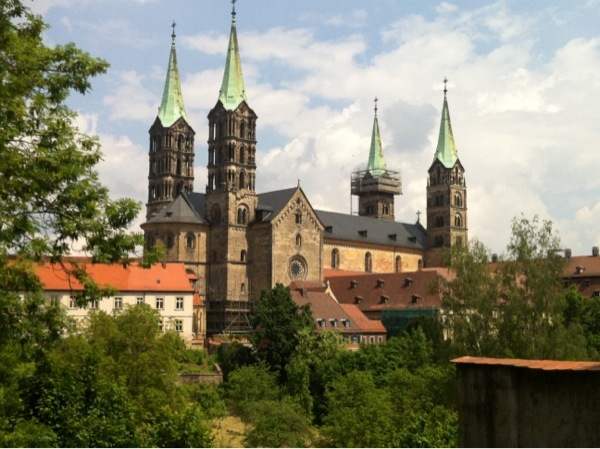 Then we head towards Bamberg, about 60km away along the river. It is which is supposed to be well worth a visit. We have accommodation just outside and summer and nice weather make getting accomodation more expensive. The river cruises are all holted as the rivers are too high, and a lot of boats cannot get under bridges. Prague is badly flooded and Robyn and Geoff are worried a lot of the paths will be cut. We took a longer route in Nurnberg so as to come in along the bike path next to the canal. This is a big industrial city and we navigated successfully via GPS to avoid the main roads. With our hotel in sight (1.4 km to go), the afternoon tea rule was envoked and we stopped for more cake. Our hotel is from another era, now residing in the red light district. 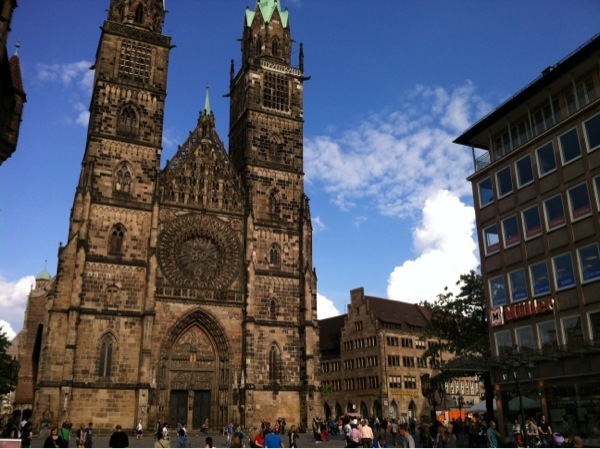 We walked to town square and admired the rebuilt church, walked past the Rathaus (town hall) and up to the medieval castle. Day 5 Dinkelsbuhl - Wald. 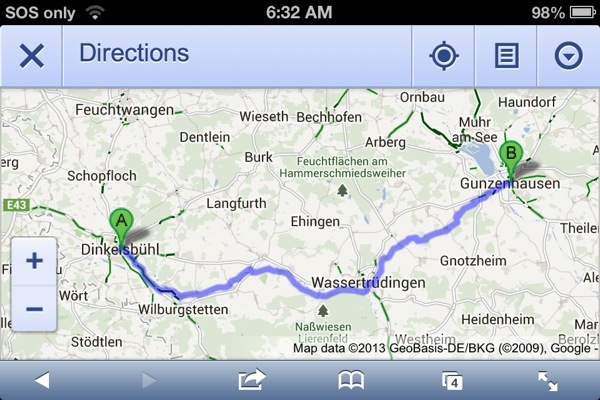 After our earliest start of 9:15 we headed off towards Gunzenhausen /Wald . It was a beautiful day. A local on an ebike stopped us and tried to convince us our planned route was rubbish. As I had programmed the route into my GPS, I needed a convincing argument to change. As it turned out, the route we took was both scenic, not too hilly and with minimum time on the road. 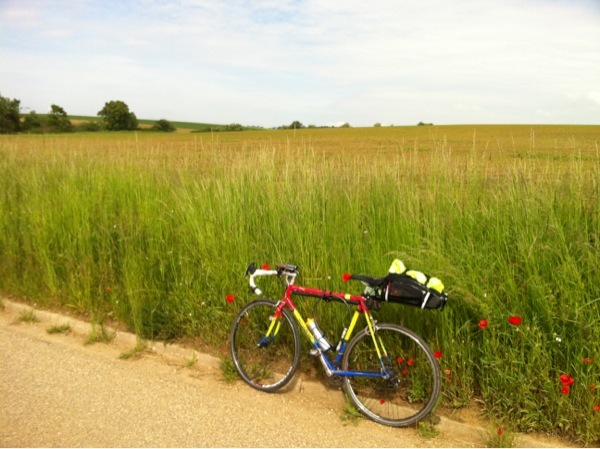 We cycled through amazingly green fields and thru lots of medieval towns. At one stop we were told of some roman ruins and took s detour to see the corn field where they lay. A late morning tea was outdoors in the town square at Wassertrudingen. Being outside was popular today. 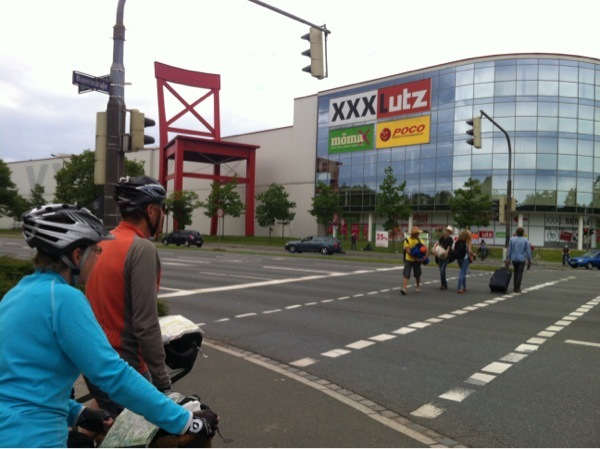 We then that the final section going north west to our booked hotel in Gunzenhausen. Once again it was a mix of bike paths, rural roads and a few busier roads. We did not realize till getting close that our hotel was actually around the lake about 5km from the main town in a little village called Wald. The hotel was a horse ranch with a large indoor paddock viewed from dining room. Lots of people arrived to wash and ride their horses. After a simple lunch at hotel, R&G had a rest and sleep, and I went for a ride around the lake via Ornbau. There was lots of bike paths, as the while area looks set up as a tourist area with lots of outdoor activities. The big lake even had. A beach and sail bards for hire. I bought some supplies and beer nuts and added 35km doing the lake loop. We ate a good dinner at the hotel. The cook was also the waiter and cashier and loved his work! We listen to NSW win game 1 of "state of origin" rugby league game from a recording I made on Internet radio, hot spotting off Geoff's mobile with unlimited data. More sunny days ahead, as we head to Nuremberg tomorrow. Day 4 - Rothenburg o.d.t - Dinkelsbuhl. I fell asleep early, being tired from jet lag. The weather is clearer, but the floods are the worst in 400yrs. They are worst on Danube, on the east side. The plan is to cycle along the cycle path along the river where possible. Arrived around 15:00 again after 55km of undulating farming country. 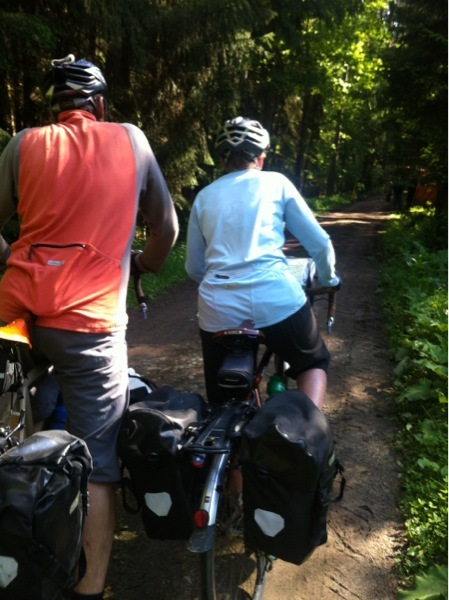 There was a lot of bike paths and the country roads were generally quite. We have a family suit with 2 bedrooms for the price of a triple, as its very quite for tourists due to wet weather. The sunny weather is predicted to stay fine for the next 4 days. This is another medieval town. The cobblestones are a menace on the bicycle. Another flat tyre today. We visited a bike shop and I got a new tube and a decent pump. The small racing pump cannot get enough pressure into the tyres to survive the rough roads. So it was a late 10:30am start. The blog is sometimes deleting my photos when I try to update it. So will just add another entry. Maybe I should have done the tutorial. Tonight at 9:00 is a free night-watchman tour. We were too tired last night in Rothenburg, so plan to do it tonight. I'm enjoying riding on the quite country roads. We stop a lot looking for the marked bike trail which can be a mixture of these roads plus Dedicated trails. Robin is in charge of maps and we validate with GPS. The best method is to put a route in the GPS having worked out the route on the map. We had beers in the main square followed by dinner in the hotel. The ravioli was superb. The night watchman tour was in German so we bailed out early. 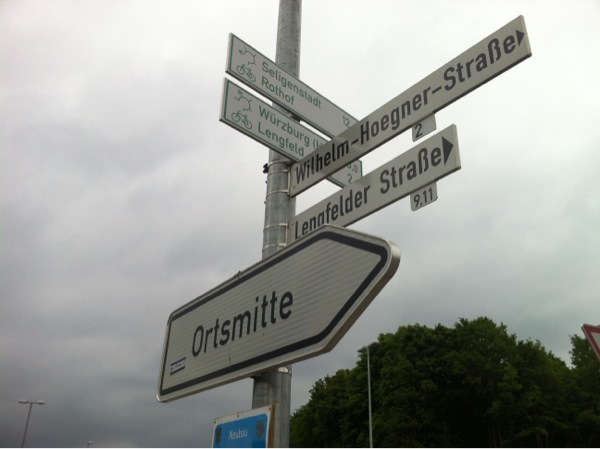 Tomorrow we plan to ride 60km to Gunzenhausen, I found a new measure on GPS called vertical meters/min. My best on a 12% climb was 20min up and 96m/min down. Not sure if this is good or bad, but will try to improve on it. Summary: 55km today; 585 vertical meters climbed. Today's plan is for a longer day, riding away from river as the tracks are flooded. Robin booked a hotel last night via Internet, as is their normal routine. The wet weather has returned. Prediction is 7-10 deg, with 10kph tailwinds & 50% rain. We arrived into the historic walled town of Rothenburg at 15:00, riding over lots of cobblestones. The rain was just starting to sprinkle after an overcast, but dry day. It was a good day of cycling (62km) with the GPS working well to keep us on the track we has mapped out last night. There was lots of little villages, and farms of greenery (no farming experts here). 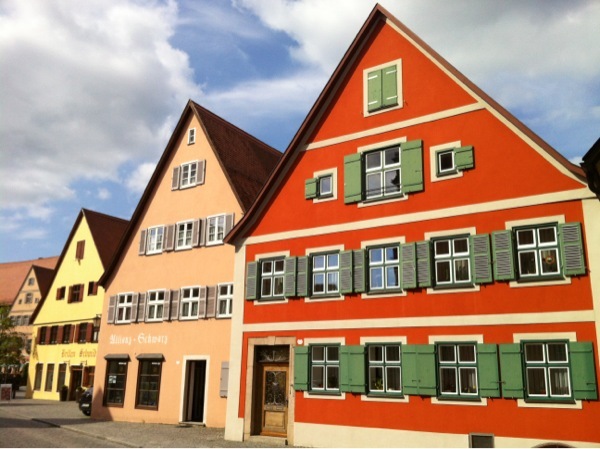 The roads were busy leaving Wurzburg, and become quieter on the rural areas. 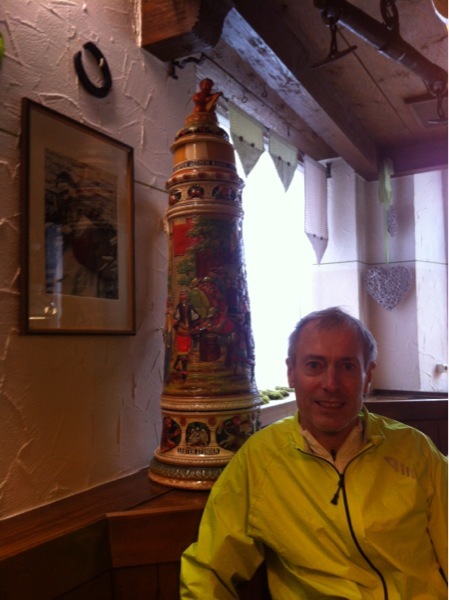 Lunch was at a pub 17 km from Rothenburg and very good. We are resting and then heading out to be tourists. After an early start due to my body clock, I threw out all unnecessary paperwork and packed. It was then I discovered I lost my prescription sunglasses, so will need to buy some cheap ones. Breakfast was included and I'm missing my weetbix, muesli and banana already, but the pumpkin seed rolls and heavy German bread almost makes up for it. Just need to borrow a decent pump to get enough pressure in the tyres. Hint/tip: scrap the 85gm tiny racing emergeny pump and bring an old fashioned full length Zefal- just Velcro it under top tube. I made the 9:30 cheap (ie all stops) train to Wurzburg. 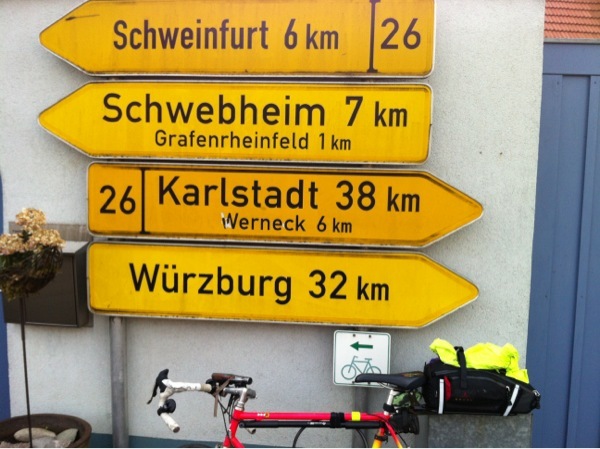 Robin & Geoff are staying outside due to long weekend and are cycling to meet me at Wurburg HBF. Last night I used the self service train ticket terminal before exiting station and it printed up the morning train timetable and prices- I'm in tune with expected German efficiency! It looks like Starbucks is the current free wifi of choice. I expect R&G will have the intel on wifi as they have a comprehensive blog on their trip. The train had a lot of bikes until Aschaffenburg. The country side looks green, so it must be a popular cycling spot from Frankfurt. On the train was a family group on a four day tour who explained the river track was cut in many places by the flooded river. I alighted at Wurzburg after 2 hrs and about 110 km and easily met R&G at the station. We cycled up the hill to the marianberg fortress. It was the seat of the bishop princess in 11th century , before they moved to the majestic residential place. We did an an English tour of the later and viewed the rebuilt rooms, which had been bombed extensively in WW2. After a beer overlooking the fast flowing river, we had dinner whilst talking to an interesting ex Czech lady. We ate at an outdoor restuarent set up for the summer wine festival. The flooding river has cut many bike tracks and also stopped the river cruise boats. Summary: 15 km local cycling; one flat tyre; two tourist sites. The bike took a while to come thru oversized luggage. The staples on the bottom had given way & they appeared to repack it & just turn the biox over. Hint/tip = tap all joins, regardless of those industrial staples or not. Nothing was lost that I know of. I had put all loose bits in plastic bags tied to the frame. After waiting 1/2 hr for accomodation kiosk to reopen, I decided to book a room near Frankfurt hopfbaunhoff (main train station) . We had passed thru there in jan so felt comfortable to take the train there. It took me a while to find the hotel due to disorientation, and no google maps. Free wifi is hard to find, and the one spot that worked was in the station, so I went back a couple of time. Dinner was late, at a local Italian, complete with a violinist for entertain. The wine size could be described as "ample" , and I enjoyed relaxing, eating and sending SMSs to home and to my cycling friends, whom I meet tomorrow in wurzburg. After a good 12 hr flight on a full plane, featuring a 13+ yr old inflight entertainment system, I headed to get a short stay visa. No problems with that (not like the grilling we got as a family in Shanghai in January). The tourist office tried to sell me a limo and driver for 6 hours for 1100¥ (Yuan), and when I asked the second time about the train, it was now 900¥ for a taxi. So in the spirit of adventure, I spent 25¥ (about AUD$4) on the fast train to Dongzhimen station (via terminal 1&2) and spent 2¥ on the subway (6 stops) to Qianmen station, right at Tiananmen Square. I joined the building crowds in the already exhausting heat walking to the Palace, and it was just 9am. Turned out to be children's day at the Forbidden Palace, so that boosted the numbers. With all the tour buses, security checks stations and barricades, it took me a bit to get oriented, but once I saw the palace gates and pre-photo picture of Chairman Mao, I was happy. In between the crowds, I tried to get the same photo Karen and I took on our honeymoon in December 1985 (another cycling holiday). After walking to the ticket entrance of the palace, and admiring all the red hats, I left plenty of time and made the reverse journey back to T3 for my afternoon flight to Frankfurt. As my bicycle was checked thru that made the transit a lot easier and I hope the Chinese reliability holds true and it arrive with me. After a stressful night before extracting a seized carbon seat post from the steel frame, I packed the bike into the cardboard box and it came in at 17kg total....under the 23kg limit. No problem getting the bike box as check in luggage, although it exceeded the "158cm" limit (from web site) my hand luggage is compact as it all goes on the rear rack. Pat drove me out and Karen arrived after work to farewell me. Time to board and see if there is inflight entertainment or I start watching the 3 movies on my iPhone. I board a battery booster to recharge the phone. 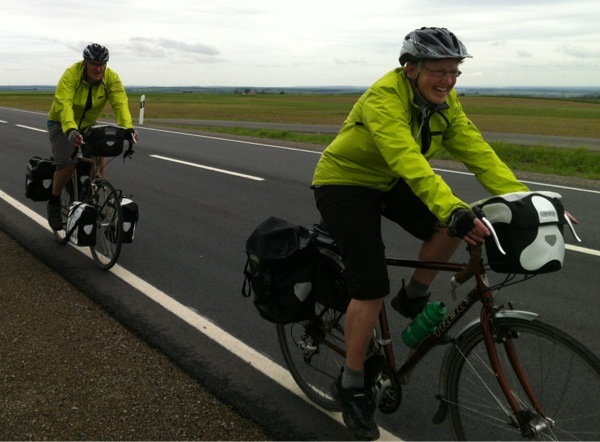 Just 5 days till I fly to Frankfurt, to meet Robin and Geoff who are spending 6 weeks to riding from Amsterdam to Prague. My time is limited to 8 days of cycling, due to my role in an IT implementation at a large customer in Sydney. 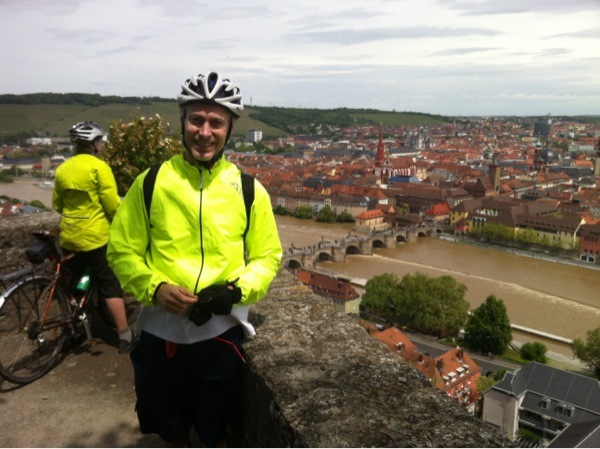 My plan is to ride the Romantic Road along the Main River (a Rhein tributary), from Wurzburg to Bamberg. The 20 yr old Lemond is the chosen bike for this ride. A new 13-25 rear cassette and 52/39 chainring was fitted. The 52 gearing is much better, combined with 13-25 cassette instead of previous 12-25. The rear tire was changed from 700x23 conti gp4000 to 700x25 conti 4 seasons, for extra durability. The Arkel Trailrider bag and Randonneur seat post rack arrived ok from Canada and fitted easily. It's expensive shipped to Oz ($245). It looks well designed and I plan to limit my luggage to 4-5kg. Also, I bought a front handlebar rack and trialed a ride with it. Not sure if I like the extra weight of 600gm + mount+ content, as it impacts the bike balance more then the tail post rack and bag. 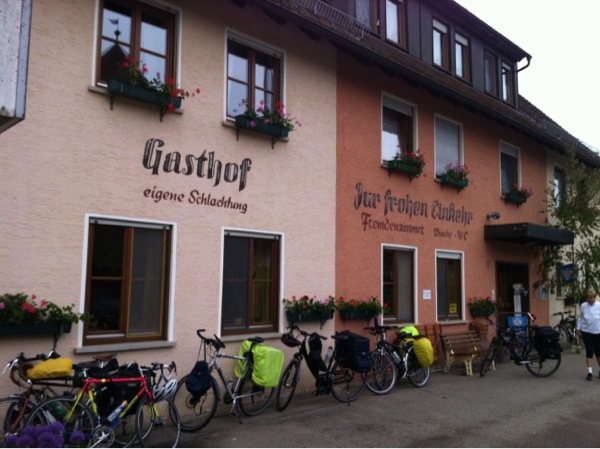 Robin and Geoff are regularly posting from the ride through Germany. It is wetter and colder then expected and I have investigated taking a train to meet them in Wurzburg, on the Romantic Road. A bike box for my travels (3.5kg) was obtained from the local bike shop. The luggage limit of 23kg should be ok. The total dimension limit is 158cm, so I may need to do some talking to avoid excess baggage. 2. 20 yr old steel Lemond - owned since new. Now my daily commute, after many kms training and triathlons.